The first female Justice Minister, the first female Defence Minister, the first woman to lead a Progressive Conservative party and the first woman to be Prime Minister of Canada, Campbell wrote an autobiography called Time and Chance. 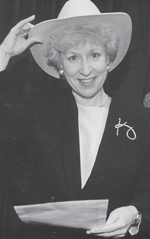 She was born Avril Kim Campbell in 1947 and studied at UBC and the London School of Economics. She taught at UBC and the Vancouver Community College and then worked for Premier Bill Bennett's office in Victoria, British Columbia. In 1980 she entered the world of elected public office as a trustee of the Vancouver School Board, serving as its Chairperson in 1983 and Vice-Chairperson in 1984, while completing her law degree at the University of British Columbia. After she unsuccessfully ran for the leadership of the Social Credit Party, she joined the Progressive Conservative Party and became an MP in 1988. She served as Minister of Indian Affairs, then Minister of Justice and later as Minister of Defense. In 1993 when she was elected as leader of the Conservatives and briefly served as Prime Minister of Canada, succeeding Brian Mulroney. She was thoroughly defeated in her first and only election as an incumbent Prime Minister. She went to work in Los Angeles as Canada's Consul General, often representating the Canadian film industry. During her relatively brief rise to prominence in federal politics, Campbell was the subject of at least three books including Robert Fife's Kim Campbell, The Making of a Politician (Harper Collins, 1993) and two stinging profiles by Murray Dobbin and Frank Davey.